Seven Years as an Educated Youth delves into president's experiences during period of change. A newly published book of the seven years that President Xi Jinping spent at a poor village four decades ago has gained popularity soon after its debut, with many analysts saying the book is encouraging and enlightening. 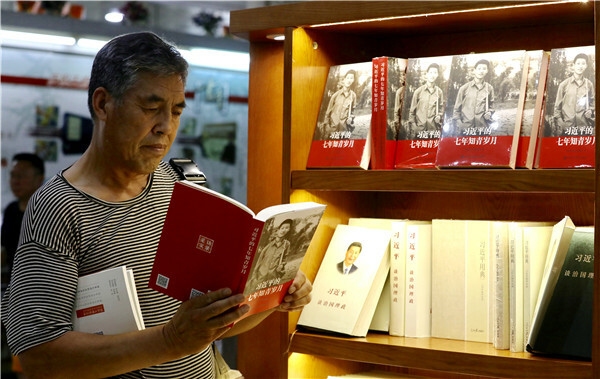 The book, Xi Jinping's Seven Years as an Educated Youth, was a collection of interviews with people who used to live and work with Xi when he was a zhiqing, or educated youth, in Liangjiahe village, Yanchuan county, Shaanxi province, from 1969 to 1975. Zhiqing refers to urban youths sent to the countryside for "re-education" amid late chairman Mao Zedong's campaign for urban youth to experience rural labor during the "cultural revolution" (1966-76). Xi was only 15 when he was sent to Liangjiahe in early 1969. The book was brought out by the Publishing House of the Party School of the CPC Central Committee. He Yiting, executive vice-president of the Party School of the CPC Central Committee, said Liangjiahe was Xi's first stop to get into society, and his life in the village had a great influence on him. After its debut last week, the book became so popular that the publishing house staff has been working around the clock to meet demand, he said at a seminar on Sunday to discuss the book. The book is a vivid text for young people to set up a positive outlook on their lives, and it also tells Party officials of all levels about how to act in accordance with the Party's discipline, he added. In the book, 29 people were interviewed, including some other "educated youths" who worked with Xi in the village and Liangjiahe villagers who worked with Xi for years. They recalled how Xi strove to help farmers and remain optimistic about life in the difficult period.